Whether you play casino games online or at land based casinos, we believe that gambling is something that people should enjoy as part of their wider leisure entertainment choices. 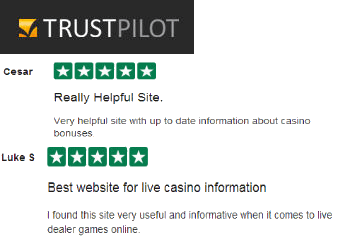 We also believe that every website that advertises or offers online gambling information should advise its visitors about responsible gambling. Keep it Responsible, Safe and Fun. We believe that playing casino games responsibly is the best approach for everyone who wishes to gamble as part of their leisure experiences. We play casino games online ourselves and we know that sometimes you can get carried away, loose control, start chasing loses and go past the stage of fun and entertainment. When this happens you can get into the stage of developing a gambling addiction. This is when the fun ends and this is when all casino players (ourselves included) need to maintain control of our gambling habits. the control measures that online casinos can provide to help you limit the amount of money or time that you spend gambling online. contact information for support agencies, such as GamCare and the National Problem Gambling Clinic who can offer counselling, help or treatment for those with an existing gambling problem. Online casinos are places of great entertainment with plenty of casino games from table games to card games, slots and live dealer games. Any visit to an online or land based casino should always be primarily for fun and entertainment. It should never be all about winning, or a reliance on winning because this is when the fun element goes away. Gambling is like any other form of entertainment. You have a budget for your leisure activities and you know that on a night out for example or a weekend away you will spend an x amount of money. Therefore, you should only ever spend what you can afford – and are prepared to lose – in exchange for the experience and enjoyment of playing. If you win, then that’s even better and you are even more satisfied that you maintained yourself and at the same time not only you didn’t pay anything for it but made a bit of money as well! Have a budget for your gambling activities, one you can afford as we have mentioned above and stick with it. Set limits to yourself not only on the amount you spend but also on the time you spend gambling and make sure that these fit your lifestyle. Sometimes it is not easy to identify that you or someone close to you has or is developing a gambling problem. However there are certain types of behaviours and habits that could be warning signs and could help you identify a potential issue. GamCare has teamed up with Sustainable Interaction and created a self-assessment tool: GamTest. There are 16 statements with regrds to your gambling activity that you can answer to a scale 1 to 10. Every online casino has the obligation to offer control measures to their players. If you are struggling to set limits to yourself then you restrict/limit the amount of money and time you spend with the online casino. All online casinos have a section where you can set your deposit limits, weekly, monthly or even daily and most offer time reality checks ( i.e a message will pop up to ask you t set a reminder after you played for x amount of time). Apart from the deposit limits which are the most common measure someone is taking when they want to control their gambling activities, some online casinos offer restrictions from specific parts of the site. For example someone might want to restrict themselves from casino but be able to still place bets on football. This is not a service that all online casinos offer but a lot do. Finally there are the options of closing your online account to take a break for a while, or ask for a self exclusion which means that you are admitting that you cant control your gambling and want to exclude yourself for an x amount of time. There is a difference between asking to close your account for a while and asking for a self exclusion, because when you want to reopen your account and have asked for a self exclusion then there are strict procedures in place in order to reopen your account. If you have tried all the above and you are still struggling to keep your gambling responsible, safe and fun then we strongly advise you to contact on of the supporting organisations. There are a few ways they can help you with counselling and advise. A self-help fellowship of compulsive gamblers wanting to address their gambling problems. A clinical treatment provider based in London, treating problem gamblers from England and Wales.